After the Merida Scultura 5000 road bike has been fitted with a full Ultegra 6870 Di2 groupset, it is this bike's turn to get a full groupset too. 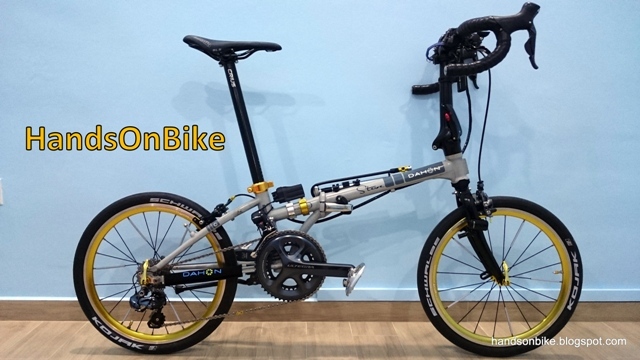 The Wheelsport Fantasy mini velo currently has a 1x11 speed setup with a mix of Ultegra 6800 and Dura-Ace 9000 parts. The right shifter, rear derailleur, cassette and brake calipers are Dura-Ace 9000, while the left shifter and crankset are Ultegra. To make a full Dura-Ace groupset, the crankset, brake calipers and left shifter will be changed to Dura-Ace. Before swapping the components, I wondered how the crankset would look if the Ultegra crank arm is changed to the Dura-Ace crankset. Before: Ultegra crankarm with Wolf Tooth chain ring and gold chain ring bolts. Looks very good! It actually looks pretty good! 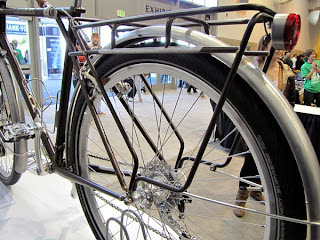 The silver on the crankarm actually matches with the silver on the rims and rear derailleur. Instead of gold coloured chain ring bolts, I will use black chain ring bolts to let the Dura-Ace groupset stand out. Length of 8.5mm for the chain ring bolts is just right, as the Wolf Tooth chain ring is thicker than normal flat chain rings. Ta-da! Dura-Ace 9000 crank arm with Wolf Tooth chain ring and black chain ring bolts. Looks good too! Weighs exactly 400 grams. 25 grams lighter than the Ultegra equivalent. While reinstalling the chain onto the drivetrain after replacing the crankset, I found that the original 11 speed chain had a few rusty links and did not move smoothly. Therefore, I had to replace the chain too. 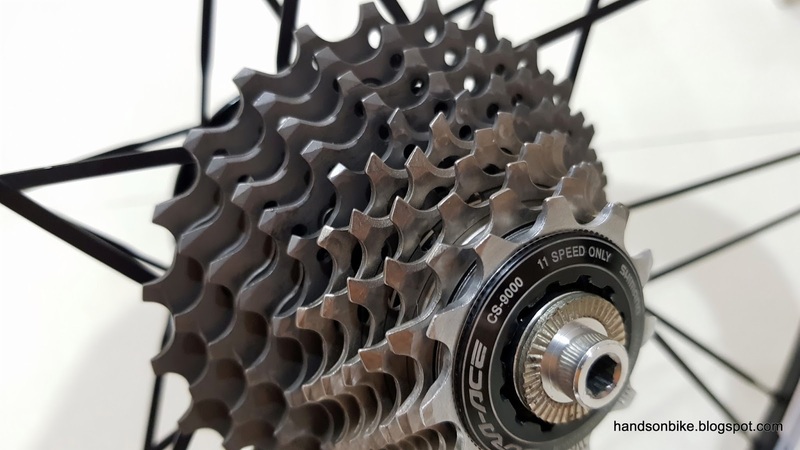 Dura-Ace grade 11 speed chain for maximum rust resistance. Also common use with 11 speed XTR. Full Dura-Ace 9000 drivetrain! Silver and black goes well together. With the drivetrain settled, the next component to change would be the left side shifter. The left side shifter was a modified Ultegra 6800 left side shifter, with the internal shifting mechanism removed to save weight. As this is a 1x11 speed setup, the left side shifter only acts as a brake lever, no shifting function is required. Nevertheless, to complete the full Dura-Ace 9000 groupset look, I decided to put on the Dura-Ace left side shifter too, even though the shifting function will not be used. Dura-Ace 9000 left side shifter, 184 grams. Modified Ultegra 6800 left side shifter, with internal shifting mechanism removed. Shiny Dura-Ace 9000 left side shifter installed. The superior grade of gloss finishing is obvious when compared to Ultegra. Matching pair of Dura-Ace road shifters. I took the chance to replace the Lizard Skins bar tape which were starting to peel off after a few years of use. The final component to change to Dura-Ace would be the brake calipers. By swapping the brake calipers with the ones on the Merida road bike, both bikes will have a complete groupset. Full mechanical Dura-Ace 9000 groupset on the Wheelsport Fantasy mini velo! Black and silver surface treatment on all the Dura-Ace components match nicely with the black and silver colours of the wheelset, and the black and white design of the other components. This mini velo is still a lightweight mini velo, since it has all the lightweight Dura-Ace components. The final weight of the Dura-Ace mini velo is just under 7.3kg (excluding pedals). Do u have any 105 or tiagra cransket / shifters that u wanna sell? I’m thinking of playing around with those parts. Sorry no extra ones lying around.